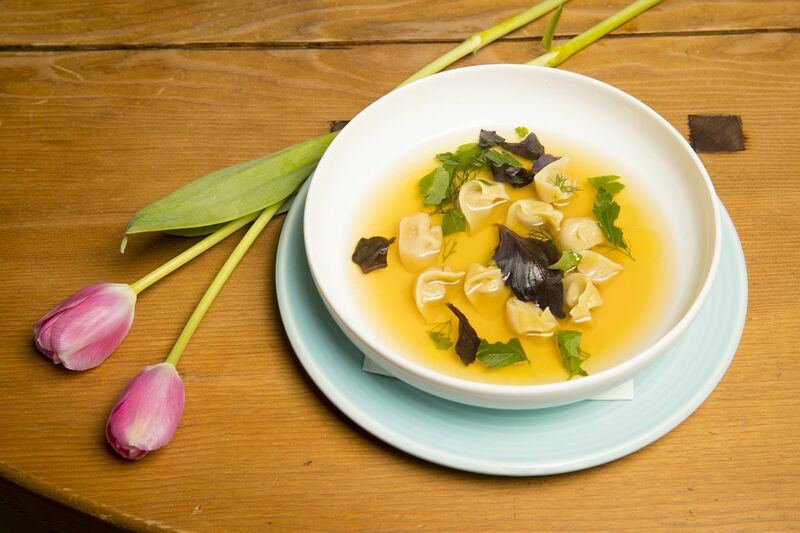 The Tortellini de Brodo at Cry Baby Pasta in the Queen Village section of Philadelphia on April 5, 2019. The tears were flowing as hard as the fire hoses on that late October morning in 2017. They traced the cheeks of Bridget Foy’s family, who stood on the Headhouse Square sidewalk while fire trucks streamed water into the smoky ruins of their restaurant at Second and South, an American comfort-food favorite for nearly 40 years, until an electrical fire burned it to the ground. From this deep sadness, though, a double dose of happiness is emerging for Queen Village: A surprising new restaurant called Cry Baby Pasta, to be followed by a fresh edition of Bridget Foy’s, rising on the site of the old one. A fall opening is projected. The rigatoni with smoked chicken at Cry Baby Pasta. The most immediate joy? It goes by the nickname “chicken riggies,” and it’s one of the signature dishes at Cry Baby Pasta, which Foy and husband Paul Rodriguez have opened a block away at Third and Bainbridge. Toothy rigatoni cradle nuggets of pancetta and plumes of smoked chicken in a blush sauce whose richness is lit by the magnetic spice of tangy cherry peppers. My lips curled into a smile almost by reflex at the unexpected sting of the chili heat. Or perhaps it was a wry sneer in the face of adversity, if you follow the sarcastic impulse of the restaurant’s offbeat name, a nod to the Garnet Mimms song popularized by Janis Joplin, whose spirit imbues this corner tavern’s lively vibe with a classic rock soundtrack that backs a boisterous neighborhood crowd, and which inspired the crying-eye motif designed by True Hand Tattoos that hover from the windows, wallpaper, and T-shirts. In a nod to Cry Baby’s earnest Italian theme, in which all the pastas snap from the freshness of being extruded in house and the bar program from Rodriguez (formerly Amada, Tinto, High Street, Fork) is stocked with amari and Italian wines on draft, the dish is simply called rigatoni with vodka sauce, and its essential ingredients are noted on the menu. But “chicken riggies,” as the dish is referred to by the staff, will spark recognition in Upstate New Yorkers who know it as a regional obsession, and who will be reminded that co-chef David Gilberg is one of their own. Likewise, when he refers to his exceptionally juicy chicken Française as “chicken French,” it’s clear the heart of this Italian menu at times beats just as much Rochester as Emilia-Romagna. Although, to be fair, Gilberg’s perfectly cooked tagliatelle twirl in a soulfully rich ragù whose salumi-spiked ground meat and minced vegetables have been slow-simmered in wine and nutmeg-scented milk with just a blush of tomato red — a manner similar to many traditional recipes. Gilberg’s wife and co-chef, Carla Gonçalves, channels another Bologna touchstone, expertly hand-folding tortellini around a stuffing of prosciutto, fresh pork, and Parmigiano, then floating the perfect dumplings in a brodo whose crystalline clarity belies the restorative depth of its pork and chicken stock. Cry Baby Pasta in the Queen Village. An inn in the Thousand Islands region of Upstate New York is where Foy and Rodriguez got the chance last summer to work with Gilbert and Gonçalves, the talented former owners of Koo Zee Doo in Northern Liberties. And their subsequent collaboration in Philly has been fortuitous. Foy was born to preside over a local haunt, and she’s taken a space with a long history as a great neighborhood destination — the former Ela, Ansill, and Judy’s — and deftly updated it for 2019, assembling a blend of handcrafted quality, casual style, warm hospitality, and affordability that feels very of the moment. It thrums with an energy that clearly connects. Nothing on the menu is over $22, and the substantial pastas hover in the mid-teens. The amari-driven cocktails from bar manager Guy Smith manage to be polished and original without being overly precious. The bar and dining room at Cry Baby Pasta can get roaringly loud. Rodriguez’s wine list is equally approachable, with several fine glasses under $12 (De Angelis Pecorino; Schiavenza Dolcetto; Barbolini Lambrusco) and remarkably fair prices on bottles that average double markups (the industry standard is three or more), like the Sicilian COS Pithos red blend, which the PLCB retails for $39, on special at Cry Baby for $60 a bottle, and $15 a glass. Cry Baby’s friendly staff, half a dozen of whom came from Bridget Foy’s, aren’t always up on all the details. A question — “what is Zibibbo?” — had one server vamping authoritatively (and incorrectly) that it was the name of a winery, then the name of a road, or a region, or a famous winemaker before she finally reported back that it is, in fact, the name of a white grape used with Syrah in Poggio Anima’s Sicilian rosato. Grilled whole sardines, filleted in the kitchen then splayed over roasted peppers and grilled bruschetta made from Goncalvez’s fresh-baked focaccia. Such flubs feel minor, though, compared to the satisfaction I get from tasting Gilberg and Gonçalves’ work in the kitchen again. The grilled whole sardines, filleted in the kitchen then splayed over roasted peppers and grilled bruschetta made from Gonçalves’ fresh-baked focaccia, are a rustic reminder of the dearly missed Portuguese flavors the two showcased at Koo Zee Doo. The meatballs with smoked ricotta are surprisingly moist. Their able embrace of Italian inspirations has been compelling. The cute little meatballs are surprisingly moist (thanks to gelatin in the mix) as they beckon from a creamy wave of wood-smoked ricotta. Anchovy, toasted garlic and lemon oil add a Mediterranean swagger to the charred broccoli; hand-turned baby artichokes tumble from the grill into shaved Parmigiana and herbs. A little hit of ground fennel in the buttermilk crust elevates the perfectly fried seafood — tender calamari, shrimp and whole smelts — for a memorable fritto misto. A drizzle of basil honey is all that’s needed to highlight the simple pleasure of buffalo mozzarella oozing its tangy cream onto Gonçalves’ grilled focaccia. The Branzino with cabbage and clams next to a painting by Bridget Foy's mother that hangs in the restaurant. A meaty fillet of crispy-skinned branzino, bending over beads of fregola pasta, yawning littleneck clams and braised cabbage, is one of the menu’s great values, even at its top price of $22. A risotto made from nutty farro paired with sweet parsnip cream, earthy mushrooms and spring onions, is a full-flavored and hearty vegetarian hit. The chicken Française — so moist because the brined meat is poached before it’s deboned and egg-washed for a quick pan-fry — was just as memorable for its side of crispy Norwis potatoes. The only slight disappointment among the entrées was the pork rib ragout, braised down into filament-like shreds that evoked the texture of a dry pulled BBQ pork. But even that dish was reasonably salvaged by the vivid corn richness of good local Castle Valley polenta. The pastas, though, spun in-house from an Arcobaleno machine by Gonçalves, are clearly the highlight that anchors a meal here with the kind of quality value that is a rarity these days for less than $20 a plate. And I particularly admire how this kitchen avoids overcomplicating the dishes. Still-snappy strands of spaghetti luxuriate in the ivory piquance of a cacio e pepe sauce whose creamy flow is a magical fusion of pasta water, olive oil, cracked pepper and cheese, the nuttiness of Parmigiano balanced by the tangy freshness of Pecorino Toscano. The smokier tone of Fiore Sardo is all that’s needed to add life to orecchiette rounds tossed with bitter broccoli rabe florettes and crunchy bread crumbs. An even lighter hand is reserved for fluted bell-shaped campanelle, which shine in a fennel-infused fish fumet beside the delicacy of fresh Louisiana gulf shrimp sautéed with garlic and pepper flakes. Gonçalves has been so preoccupied with the pasta program that the one-time pastry chef hasn’t yet had much time to expand the small dessert list beyond the (very) bittersweet chocolate panna cotta glazed in balsamic caramel dusted with crumbled fig biscotti, and a torta della nonna pie topped with pine nuts and filled with lemony cream. The torta della nonna at Cry Baby Pasta. That crumbly little pie and its custard-y heart offered such a charming, homey comfort, I tried to praise it to my tablemates — though I don’t think they heard me amid the roar of diners deep into their bowls of chicken riggies and swirling coupes of amari-tinged cocktails. The main dining room, with its industrial windows, wood floors and board-lined ceiling, has a considerable noise problem once the crowd warms-up, and the owners know it’s something to be reckoned with down the road. But for now, these are the sounds of a comeback story that’s roared to beautiful life in the form of a bright new neighborhood hub serving the kind of affordable good flavors I’d indulge in regularly if I lived nearby. For Bridget Foy’s family, this Cry Baby’s tears are for the happy ending. The neighborhood restaurant has been reimagined for 2019 by the family behind Bridget Foy’s at this well-loved Queen Village corner tavern, formerly Ela, where house-made pastas anchor an impressively affordable menu of Italian inspirations with great drinks and a lively rock-and-roll theme. The roaring noise level can be a drag, and the friendly service can be spacey. But the zesty scratch cooking from talented husband-wife duo David Gilberg and Carla Gonçalves (ex-Koo Zee Doo), paired with polished cocktails and fairly-priced, interesting Italian wines, add up to the kind of casual-but-quality restaurant I’d visit weekly if I lived closer. MENU HIGHLIGHTS Tortellini en brodo; egg drop soup; meatballs with smoked ricotta; fritto misto; grilled artichokes; charred broccoli; bruschetta toasts (chicken liver; burrata; sardines); spaghetti cacio e pepe; smoked chicken rigatoni in vodka sauce; tagliatelle Bolongese; branzino; chicken Française; mushroom farotto; torta della nonna. DRINKS Italian wines, aperitivi and cocktails are a draw. The well-made cocktails incorporate Italian touches, from peppery olive oil in the Jiggery Pokery riff on a dirty martini to the Cynar-spiked Purple Moon and refreshingly citrusy Don’t Cry Be Bitter. Affordable wines by the glass, including many on draft, offer pours of Aglianico, Vermentino and curiosities like a Zibibbo/Syrah rose, while very fair bottle markups (hovering around two-times cost) are good incentives to try a bottle from Occhipiniti, Vignetti Massa or Nervi-Conterno. Beer selection is small but solid (Menabrea; Bull Frog; Cigar City.) . WEEKEND NOISE You can cry as loud as you want and not be heard over the din. An investment in sound proofing is on the owners’ minds. IF YOU GO Dinner Sunday, Tuesday through Thursday, 5-10 p.m.; Friday and Saturday, until 11 p.m.
Not wheelchair accessible. There are two steps at front door and bathroom is not accessible.